Dhaka : Durga Puja, the biggest annual Hindu festival, began on Monday in Bangladesh capital Dhaka and elsewhere in the country with due religious fervour. During the five-day Durga Puja festival, the Goddess Durga is worshipped in her different forms. People organise different programs including dancing, traditional drummer perform to celebrate festival. 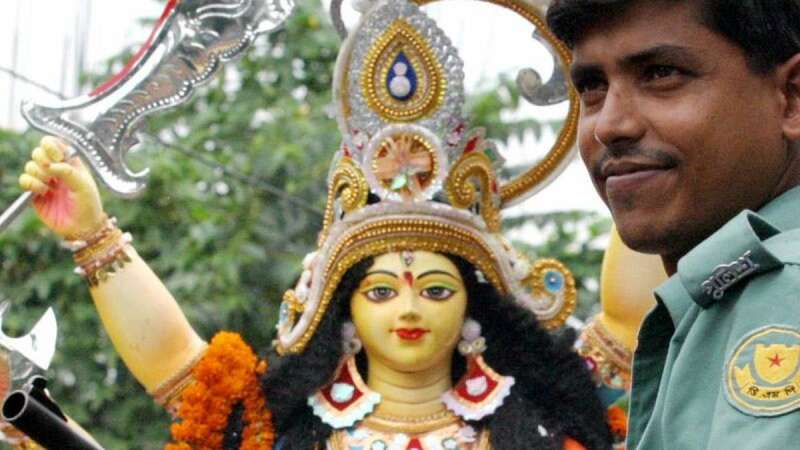 Nirmal Kumar Chatterjee, general secretary of Bangladesh Puja Udjapan Parishad (BPUP), the largest organization of Hindus in Bangladesh, told Xinhua that this year the Durga Puja is being celebrated at over 31,000 pavilions in Bangladesh including 200 in Dhaka. Security arrangements across Bangladesh have been beefed up for peaceful celebrations of the festival of minority Hindus, which will end with the immersion of the idols on October 19. On the occasion of the largest Hindu festival, Bangladeshi President Md Abdul Hamid and Prime Minister Sheikh Hasina felicitated the country's Hindu community on Monday.